VeggieTales: An Easter Carol – getting ready for the holiday! Easter is quickly approaching and here’s a way for kids to get excited about the holiday, by watching VeggieTales. You can never go wrong with VeggieTales. This Christian DVD like all “Veggie” movies always has the perfect combination of quirky jokes, songs and the big Christian lesson that leads the whole story. 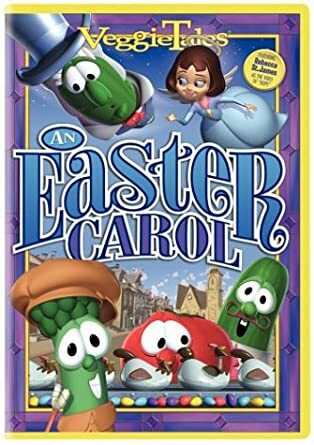 VeggieTales: An Easter Carol is basically the sequel to VeggieTales: A Christmas Carol. It tells the story of how Bob and Larry do all they can to stop Ebenezer Nezzer from taking down a church. This Christian movie begins with Mr. Nezzer and we quickly notice that Spring has arrived in London and Easter is very near. Everyone in town is quite glad that Easter is close, therefore, flowers are being sold and Easter egg hunts are occurring. A lot of Easter-related festivities are going on but Mr. Nezzer is really not into the whole thing. Later on, we move on to St. Bart’s Church where Reverend Gilbert is with his wife, Mrs. Gilbert and his son Edmund and they’re preparing to reveal a new stained glass window on Easter Sunday on the church. At this moment in this Christian DVD, Mr. Nezzer passes by and it makes the Edmund wonder the reason why Mr. Nezzer hasn’t visited the church. The reverend explains to his son that Mr. Nezzer used to come to Easter service with his grandmother but after her passing, he just stopped going. The funny thing is that Mr. Nezzer from VeggieTales: An Easter Carol owns an egg factory, plastic eggs that is. He has lines of mechanical chickens that “lay” plastic eggs and Easter is the busiest time of the year. Cavis (Bob the Tomato) and Millward (Larry the Cucumber) both work in the factory and they’re arguing as to which one of them is going to ask Mr. Nezzer if they can take the day off and go to church for Easter service. How did they come to work at the factory? Well, a year before they had accidentally burned down Mr. Nezzer’s theatre, therefore, they began working at the factory to pay off what they owed. Cavis is the one brave enough to ask Mr. Nezzer if they can have the day off but he actually denies his request. After this encounter, we hear Mr. Nezzer sing a song which explains with more depth about the factory and his beloved grandmother who started it all. Basically, Mr. Nezzer from this Christian movie has a saying his grandmother would always say secure in his mind “Easter means no death”. He takes this message a bit too literal as he thinks that if he produces many amounts of eggs, his grandmother will never die. Soon the town’s reverend visits him and asks if he’ll be attending Easter service. Mr. Nezzer declines since he believes that the church takes away the people that can buy eggs. He takes the moment to announce that he’ll be opening an Easter theme park where he will provide everything about Easter. What shocks everybody is that he’ll build right where the church is so It’ll eventually be torn down. Cavis and Millward are indeed shocked and try to change Mr. Nezzer’s mind but all he does is fire them. Later on, Mr. Nezzer is at the factory going over the “Easterland” plans and falls asleep. Soon he is woken up by a voice that is calling out to him. He looks at his grandmother’s picture next to him in his desk and the image just pops out of the frame. Ebenezer is frightened and confused, how can his grandmother be there? Grandma Nezzer makes sure that her grandson knows that she’s not a ghost but a vision he’s having. Soon it is revealed to him that yet another visitor will come by that will explain to him the real importance and reason of Easter. Outside of the factory Cavis and Millward have a plan to uphold. They want to sneak into the factory and take Mr. Nezzar’s plans of Easterland so that he won’t be able to realize it without the plans. Now, Will Mr. Nezzar truly learn the real meaning of Easter? Will the plans of Easterland be stopped? Find out by purchasing the Christian DVD VeggieTales: An Easter Carol! A perfect Easter movie for your young ones.